A Rising Star is a business or a company that is relatively new to the debt capital markets with little or no history of debt repaymentDebt ScheduleA debt schedule lays out all of the debt a business has in a schedule based on its maturity and interest rate. In financial modeling, interest expense flows into the income statement, closing debt balance flows onto the balance sheet, principal repayments flow through the cash flow statement, completing the scheudle, which makes it difficult to assess its credibility. Despite the lack of history, the company’s performance is strong enough to attract a certain group of investors,. However, because of low credit rating, the company’s bonds are often considered too risky. 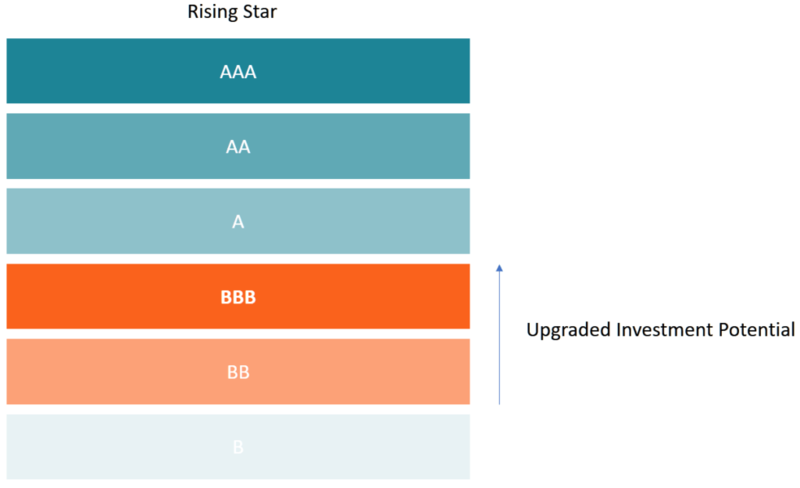 If a rising star continues to improve its credit quality and attains the required asset ratioLeverage RatiosA leverage ratio indicates the level of debt incurred by a business entity against several other accounts in its balance sheet, income statement, or cash flow statement. Leverage ratios include debt/equity, debt/capital, debt/assets, debt/EBITDA, and interest coverage. This guide has exmaples and Excel template, it is upgraded to an investment gradeS&P - Standard and Poor'sStandard and Poor's (S&P) is a market leader in the provision of benchmarks and investible indices, as well as credit ratings for companies and countries, and other financial information services. bond. At this level, it comes with a relatively low or no risk of default. Its bonds are somewhat higher than the usual ‘BB’ to something like ‘BBB’ or ‘A3,’ meaning it’s a relatively safe investment. Assume three-year-old Company X dealing with oil exploration discovers oil deposits in a practically unexplored country. The FAM (Financial Accountant Manager) and the board realize that their operations will be futile without substantive funding. So, they work to solve their temporally financial shortcoming of $1.2 billion by issuing bonds to aspiring investors. Unfortunately, due to their low reputation in the market, their only credit options lie in junk bondsJunk BondsJunk Bonds, also known as high-yield bonds, are bonds that are rated below investment grade by the big three rating agencies (see image below). Junk bonds carry a higher risk of default than other bonds, but they pay higher returns to make them attractive to investors.. The issue arises despite the company’s recent completion of the first phase pipeline construction that catapulted it to being one of the most profitable businesses in the country and in return, put it on the spotlight of large investors. However, it still faces difficulties securing bonds. Though on the surface the exploration seems profitable and being a rising star, Company X still requires an impressive credit record to receive proper endorsement from credit rating agencies to issue secure bonds. A rising star must make desperate efforts to attract investors through listing in high-yield bonds. It means that an emerging company at this stage needs to offer extremely high returns to clear the doubts of the aspiring lenders. An obvious caveat to this opt-in is that these bonds are rated extremely low by Moody’s and other reputable credit agencies. However, on attaining a rising star status, it enjoys the underdog’s favorable reprising that’s fair to all its stakeholders – both the company and bondholders. Surprisingly, the bonds are still under-rated and categorized as junk bonds. Both the rising star and fallen angelFallen AngelA fallen angel is a bond that was rated investment-grade but has since been downgraded to junk status due to the declining financial position of its issuer. The bond is downgraded by one or more of the big three rating services such as Fitch, Moody’s and Standard & Poor’s (S&P). bonds fall under one big umbrella of junk bonds. Essentially, junk bonds refer to a promise (without guarantee) that, from the principal amount borrowed, the company will pay back (on maturity date) a given interest(coupon). Unfortunately, corporations opting to junk bonds face little to no financing options, which is a red flag to all aspiring investors. The limitation, therefore, nudges the firms to offer their bonds at alluringly low prices but high returns just to attract investors. Nevertheless, in practice, junk bonds are treated like regular bonds. Despite fallen angle companies being on the market for an extended period, they were once reputable companies. Regrettably, their performance’s been deteriorating over time, resulting in low traction and overall loss of attractiveness in the market, which harms their credibility. On the riskiness scale, they are riskier than rising stars. In contrast, rising stars are enjoying their newfound spotlight. They’re seeing their credibility steadily improve, though, their credit rating remains low. But on the brighter side, they’re on track to gaining credit quality worth of investment grade. That’s why they less risky compared to fallen angels. Coping with change and other alarming growth factors. The dark hole in such ventures puts many investors at bay, either watching or speculating. It, in return, harms the demand for the rising star’s bonds hence placing the company on the sidelines. Nevertheless, it gets few risk takers. On the downside, however, the reprising is too expensive. It is apparent by now investors must be cautious about their investments as they stand a chance of losing large amounts of money. Also, the investor needs to be highly motivated and most importantly, they must be experts in analytics, especially in credit. In fact, it’s the sole reason that these kinds of investments attract colossal corporations and exceedingly motivated investors. It is an enormous task to speculate or identify a rising star at the right stage of the market cycle. However, the risk is worth the returns. It is because, at this stage, the company is experiencing growth and credit is steadily improving. Soon, under careful monitoring, the company’s bonds will be secure. First, the company will be able to meet its financial obligations. Secondly, the demand for bonds may go through the roof, leading to high prices. In return, the investors get the benefits of clearance of doubts where they get high returns from the previous premium offer before the upgrade, and they benefit from the rising value of the bonds. Lastly, it is an indication to the company that there is a whole new avenue of funding. The funding cost will go down. It will get access to vast databases of ready investors. It will also appear in the indices used to benchmark active and passive funds. Rating AgencyRating AgencyA rating agency is a company that assesses the financial strength of companies and government entities, especially their ability to meet principal and interest payments on their debts. The rating assigned to a given debt shows an agency’s level of confidence that the borrower will honor its debt obligations as agreed.